Vinegar isn't a typical cake ingredient -- unless you're making the lightly chocolate-flavored, crimson-hued red velvet version. If you leave it out of the ingredients, chances are your cake will turn out just fine. But adding it may help make your cake light and tender, or preserve the reddish color. 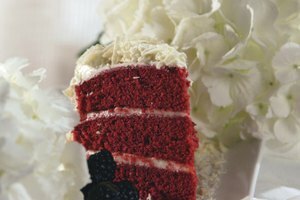 Red velvet cake contains baking powder and baking soda to leaven, or raise, the height of the batter. Both are used to ensure that the cake, which contains cocoa powder that makes a batter resist rising, bakes up light and high. 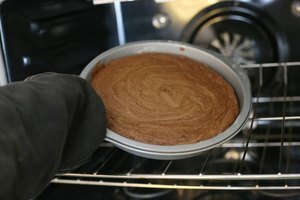 For baking soda to effectively leaven a cake, it must react with an ingredient that contains acid. 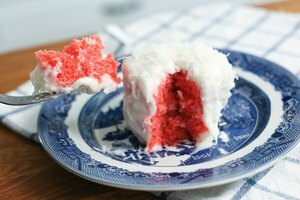 Although most red velvet cake recipes contain acidic ingredients such as buttermilk and cocoa, the addition of vinegar provides just a little extra acid to ensure the baking soda can do its best rising work. Another potential reason that vinegar is an ingredient in red velvet cake recipes has to do with the hallmark color. Originally, the color of the cake came from the addition of beets or beet juice, not the red food coloring of current times. When beet juice has too alkaline an environment, it bakes into a bluish hue -- so you'd end up with blue suede, rather than red velvet, cake. By adding vinegar to the baking soda, and then the whole mixture to the batter, the cooking environment for the beet coloring is more acidic and results in a red cake. Nowadays, most people use red food coloring, which isn't reactive to pH changes -- but the tradition of vinegar in the cake persists. 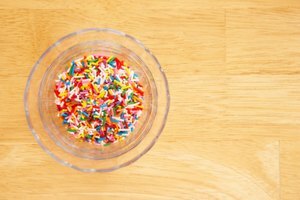 Most recipes that make a single cake call for just a tablespoon of vinegar. Almost any type of vinegar will do, including white or apple cider. You can substitute another acidic liquid for the vinegar too. 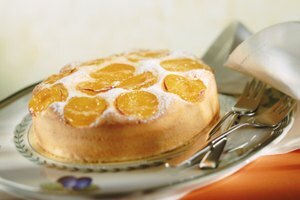 Choose something with a light flavor that won't alter the taste of the cake -- such as lemon juice.